Engines are reported by seller to be overhauled including heads, carburetors, plugs, wires, etc. Hours are recorded from recent survey. Fuel consumption is unrecorded. 1000-1200 RPM nets about 7 knots. There is an Onan generator which has not been used and the condition and KW rating are unknown. Engine room is ventilated by a 12 volt fan. Although the model of this boat is identified as A-39 the seller reports over all length is 45 feet. Carvel plank construction surveyed in September 2018. Condition was found to be "Good and Serviceable". Bilges are dry and the seller reports the bilge pumps rarely or never activate. Appearance of much of the boat is original and kept in covered moorage. The boat has been used as a live aboard since about 2006. Wood boats tend to be warmer and dryer when used as live aboard as they don't sweat like fiberglass boats do. The wood offers a better insulation especially to the winter cold. Water tanks are identified in recent survey as quantity 2 volume not recorded. Holding tank and associated plumbing is newer approximately 30 gallons and pumps out to deck only. Black water tank is polyethylene. Entering saloon by the starboard side companionway from the aft deck the galley is to port. It has a over / under fridge and freezer, microwave, toaster oven, sink with high mount faucet. All stainless steel counter tops give it a very modern look. To starboard is a settee with convertible table, high or low as this area can be made into a sleeping berth. The settee is missing upholstered cushions having been used previously with large pillows. Floors in this area are cork with stainless trim for the engine hatches. Windows in the salon have roll up shades which are in need of replacement. The large aft cabin is accessed centerline by stepping down. It has a washer/dryer combo mounted in a big utility closet to starboard. This room also holds the central vacuum system and a hot water tank. A large double berth is starboard and a twin size berth is to port. The head and shower are on the port side. They appears as clean and functional. The forward cabin is accessed center in the saloon. It is a "V" berth with head to starboard. Inside this vessel feels like a big boat with lots of room. The seller reports the electric wall heaters are not serviceable and therefore has used plug in heaters during winter months. 10% discount on marine canvas covers! Windlass is electric Powerwinch brand. Survey identifies this as operable. Ground tackle is chain and three strand rode of unknown age or length. Chain appears in good condition. Bow roller needs repair or replacement. Navigation instruments listed in the survey of 2018 appear to have all powered up. CB-Midland, VHF- Horizon Explorer by Standard, 310 Hailer/ Alarm / Intercom / Horn by Ray Jefferson, Tigershark Loran Receptor, Speed-Data marine 2200, Depth-Data Marine 2700, Auto-pilot Wesmar AP800, Radar-Goldstar Turbo 951. There is a new spare bilge pump stored on board. Modern galley, washer / dryer and central vacuum system are just a few of the improvements this boat has seen in recent years. It has been used a comfortable live aboard until the owners moved out of the area. The slip is available today as a 12 month sublet which gives a new owner lots of time to find permanent moorage. The vessel has a recent survey where the condition was determined to be "Good and Serviceable". These boat details are subject to contract. This Pacemaker A-39 Aft Cabin has been personally photographed and viewed by Gary Buck of Boatshed Seattle. Click here for contact details. Please note this comments section is public. Please do not post your personal details here. 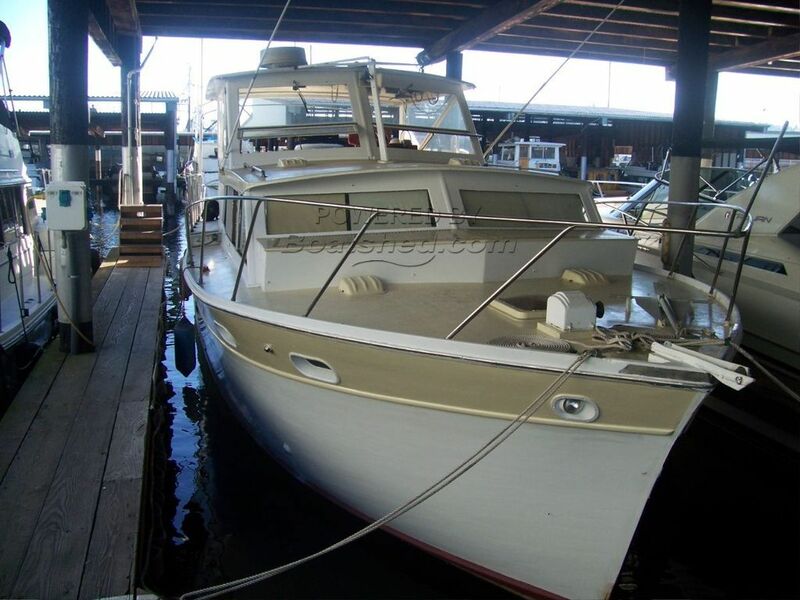 To enquire about purchasing this boat, please contact the broker directly at garybuck@boatshedseattle.com. Please read our commenting guidelines before posting.